TREE NUT AND SEED OILS–A BENEFIT TO SOME– A VICIOUS TIGER TO OTHERS! Need a little argan oil to soften your dry skin? I had never heard of the stuff until recently, but I’m learning quickly about its allergenic challenges along with its benefits, thanks to the helpful comments I received on this blog. The oil comes from a tree nut, which explains why people with tree nut allergies are experiencing skin irritation after using the oil. Because argan oil and shea butter have beneficial moisturizing effects on the skin, many cosmetic, body, and hair care manufacturers include them in a host of new products. They’re in common use today and turning up everywhere, causing unpleasant allergic reactions in people who suffer from tree nut allergies. Prompted by the comment about a previous post (Beware the Cashew Allergy–and the Secret Mango Culprit! ), I began to research the plaguing issue of allergic reactions from nut-derived ingredients, like tree nut oils, in body care and beauty products. What seems like a benign moisturizing lotion designed to soothe and comfort dry skin just might be the hidden culprit of a miserably itchy rash. People with serious tree nut allergies are almost always super-vigilant about avoiding any kind of nuts or foods that contain nuts or nut oils, knowing that eating them will cause serious reactions, like anaphylaxis, that could send them to the emergency room. Serious tree nut allergies don’t usually come and go–they are generally life-long. But what about people who rarely eat nuts and don’t realize they may have sensitivity to tree nuts and products containing nuts and nut oils? 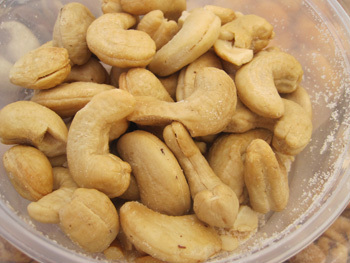 Common tree nuts include Brazil nuts, cashews, hazelnuts, macadamias, pecans, pistachios, pine nuts, and walnuts. 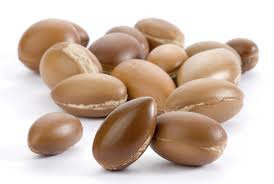 Uncommon tree nuts, used mostly in the form of oils in cosmetics and beauty, hair, and body care products include the argan nut, sold as argan oil, and shea nut, marketed as shea butter. Milder reactions to tree nuts may result in itchy rashes or pesty eczema that people might not readily trace back to nuts or nut products. 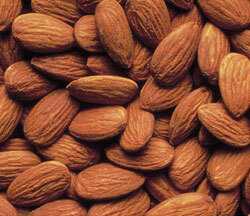 After all, nuts are healthy foods packed with vitamins, minerals, and a host of antioxidants. Sufferers of these nasty, and sometimes very ugly, rashes may be applying beauty and body care products regularly without realizing they are THE PROBLEM. Another puzzler is allergic symptoms that show up after long-time use of a nut-or nut-oil-containing product. Manufacturers may say their product does not contain detectable protein residues from tree nuts, the trigger that causes allergic reactions, yet people sensitive to tree nuts and nut oils still react with eczema, rashes, and skin eruptions that drive them crazy with severe itching or burning. Seeds, like sesame, sunflower, pumpkin, and flax, and oils from these seeds are also troublesome for some allergy sufferers and may cause similar reactions. The real issue is that people don’t tend to read ingredient labels of the body care products they buy. And in some cases, not all of the ingredients are listed on the product label because there are so many. In those cases, consumers are encouraged to contact the product manufacturer. Because the ingredients of these products are usually in a daunting list of unfamiliar chemicals, most people ignore them. While tree nut or seed oils used in cosmetic products may appear in the ingredient list, warning notations below the ingredient lists are rare and strictly voluntary. Just like foods containing tree nuts and other food allergens must be disclosed by naming the specific nut on the product packaging, the same ought to be protocol for body care and cosmetic products. Poor Claude (comment section below) suffered a double whammy when he first applied argan oil to soothe the rash on his hands and body caused by eating cashews and pistachios. 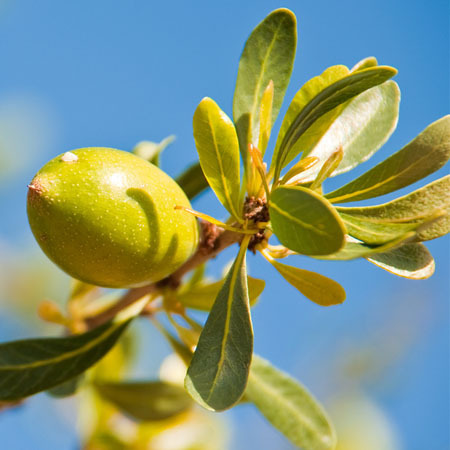 Argan oil is derived from a nut tree grown in Morocco. Users of the oil consider it a healthy culinary, cosmetic, and medicinal oil, but for Claude, the oil added fuel to the fire. Then, when Claude applied Cetaphil Lotion to alleviate his rashy misery, the rash worsened. Little did he realize that the macadamia oil in this product piled more fuel onto the raging fire. The product lists the macadamia oil in its ingredients, but Claude was unsuspecting that he actually had a nut allergy. “Thank you, Zel, for helping lots of people, including me. 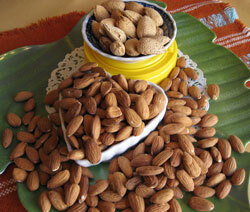 Argan oil is from a tree nut, very similar to Pistachio. Lots of people report rash with Argan oil (used for hair & skin). I have rash on my hands & body recently from eating cashew and pistachio. Then I was foolish to use Argan oil for the rash & bleeding skin. And it got TWICE WORSE. 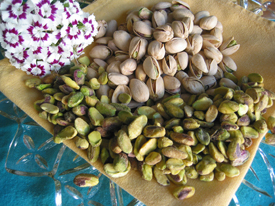 If you Google pictures of Pistachio versus Argan nuts … the clusters are similar. Those who are allergic to tree nuts might want to add argan oil to their list of allergens to avoid. Argan oil may contain similar proteins as tree nuts that trigger life-threatening allergic reactions, namely shortness of breath and anaphylaxis, and should be avoided. Argan oil is extracted from the almond-like nuts of the argan tree, Argania spinos, a fruit-bearing tree that grows wild in the desert regions of Morocco, Israel, and Algeria. The nuts, considered the fruit of the tree, are classified as tree nuts. Because argan oil is not highly refined and is cold-pressed, it may retain some or all of the allergenic protein that causes allergenic skin reactions in some people. Allergic reactions to argan oil include skin eruptions that might resemble acne appearing on the neck, upper back, chest, and around the hairline. Other people may react with contact dermatitis, appearing as red, scaly and itchy skin. 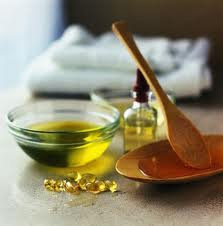 One person loved the way her skin looked while using argan oil but reported having a sore throat and swelling of the tongue she never connected to the oil until she discontinued using it and the symptoms disappeared. After using argan oil shampoo, some people developed severe dryness of the scalp, itching, and even pain. Beauty in the Breakdown Blog reported dramatic breakouts with red, itchy, bumpy, and burning rash over the hands, face, shoulders and head after using argan oil on the hair. Blog author Emily Bell says, “From my research, I have collected my own preliminary list of what to avoid in beauty products if you have a tree nut allergy: argan oil, almond oil, macadamia nut oil, shea butter, ginkgo biloba, and any derivation of walnuts such as walnut shell powder or Brazil nuts such as Brazil nut protein (in the Aveda Be Curly Style-Prep). Sold as a non-greasy oil for softening and hydrating the skin, the argan oil is used on the scalp and hair as well as the skin. As hair oil, it’s used to prevent frizzing and split ends. With its high fatty acids content, the oil is thought to aid in preventing brittle hair. Because it contains high levels of vitamin E and antioxidants, some consider it to have anti-aging properties that help the skin retain its elasticity, softness, and youthful appearance. In addition to being the source of oil used in cosmetic products, the argan tree provides other benefits in its native region. Its leaves are healthy food for cattle, while the wood becomes fuel for indigenous people. 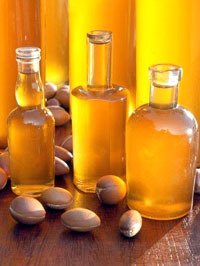 The oil also has culinary uses in the regions where the argan tree is grown. Home cooks drizzle it on couscous and other native foods. The oil extraction process produces a thick residue that’s sweetened by Berber cooks and used as a dip for bread, a traditional breakfast treat. Medicinally, the oil is a good source of unsaturated fatty acids, tocopherol, and phenolic compounds considered beneficial in preventing cardiovascular disease, prostate cancer, and atherosclerosis. Some studies reported the oil helps to lower cholesterol, stimulates circulation, and improves immune function. Because I use so few cosmetics and body care products, I never gave shea butter much thought and had no idea of its origin until now. Shea butter, I learned, is derived from a fruit-bearing nut tree that grows wild in West and Central Africa and is known by many names, sometimes called the karite nut or vitellaria paradoxa. The fruit of the tree looks similar to an avocado, and when crushed, it produces oil highly prized for use in cosmetics. The oil of the shea nut contains only a minimal amount of protein, the constituent in tree nuts that triggers allergenic reactions. It’s not considered highly allergenic, but very sensitive people may want to exercise caution and avoid products containing shea butter. 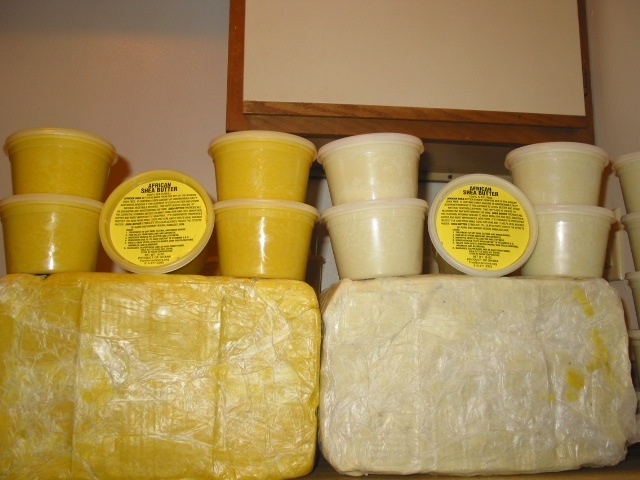 Though shea butter is not commonly used in cooking, it has sometimes provided a good substitute for cocoa butter used in chocolate processing. Allergic symptoms may be as severe as anaphylaxis and asthma or mild as allergic rhinitis. Using shea butter can also result in annoying symptoms like dermatitis or hives, known medically as urticaria, resulting in itching or burning. Some people have even reacted with vomiting. On the positive side, one health study published in the British Journal of Clinical Pharmacology in 1979 noted a medicinal value for shea butter in reducing nasal congestion in people suffering from rhinitis. Known mainly for its ability to soften and soothe dry skin, shea butter is often applied to calm skin rashes, dermatitis, eczema, and psoriasis. Yet, for some people with tree nut allergy, shea butter is the cause of those miserable rashes and severe itching. I want to express my appreciation to everyone who has taken the time to offer comments and encourage other to share their issues, too. Those comments were extremely helpful and are what prompted me to do a bit of research and share what I’ve learned about ingredients I never suspected would be problematic. While my son is still plagued with itchy rashes that drive him a bit nutty, he is still sorting out troublesome ingredients that may be hidden in unexpected places. Please do keep the comments coming. As new information comes my way, I’ll gladly pass it on in this very nutty blog. Bell, Emily. “Argan oil update: tree nut allergy?” Beauty in the Breakdown. June 20, 2013. Berrougui, H., Cloutier, M., Isabelle, M., and Khalilm A. “Phenolic-extract from Argan Oil (Argania spinosa L.) Inhibits Human Low-density Lipoprotein (LDL) Oxidation and Enhances Cholesterol Efflux from Human THP-1 Macrophages.” Atherosclerosis. 2006 Feb;184(2):389-96. Epub 2005 July 12. Castle, Jill, “14 Hidden Allergens in Everyday Products: Common Foods and Non-Foods Contain Hidden Allergens.” About Health. January 25, 2015. Drissi, A., Bennani, H., Giton, F., Charrouf, Z., Fiet, J., and Adlouni, A. “Tocopherols and Saponins Derived from Argania spinosa Exewrt, an Antiproliferative Effect on Human Prostate Cancer” Cancer Invest. 2006 Oct; 24(6):588-92. “Food Allergen Labeling And Consumer Protection Act of 2004 Questions and Answers.” FDA: U.S. Food and Drug Administration. July 18. 2006. “Nut and Peanut Allergy.” Teens-Health from Nemours. “Special Precautions when Using Moroccan Oil Shampoo.” Argan Oil Care. July 15, 2014. Summers, Gerrie. 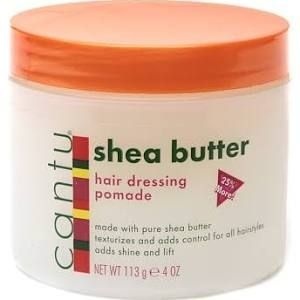 “Shea Butter: What It Is, Why It Works.” About Style. British Journal of Clinical Pharmacology. 1979 May; 7(5): 495-497. “Tips for Avoiding Your Allergen.” FARE: Food Allergy Research & Education. “What are Argan trees; what is argan oil?” Yahoo Answers.